^ Animals as Cold Warriors: Atomic Animals（冷戰的動物戰士：原子彈實驗動物） 互联网档案馆的存檔，存档日期2012-08-14. 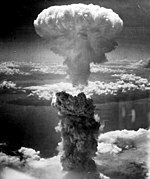 ^ 75.0 75.1 Operation Crossroads: Fact Sheet（十字路口行動數據列表） 互联网档案馆的存檔，存档日期2012-10-24. 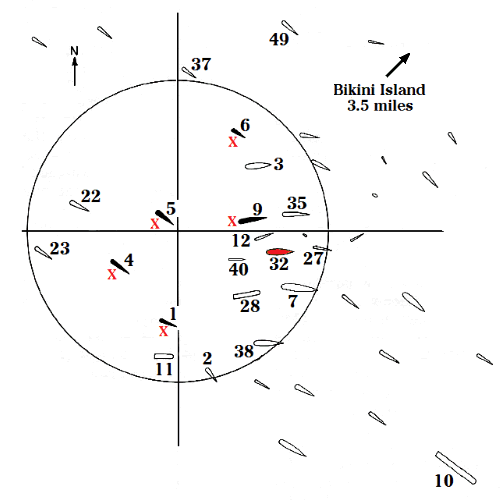 ^ 77.0 77.1 A Short History of the People of Bikini Atoll by Jack Niedenthal（比堅尼原住民簡史） 互联网档案馆的存檔，存档日期2015-04-16. 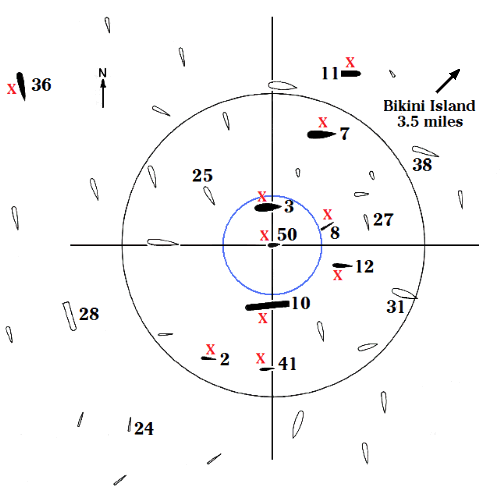 ^ Bikini Atoll Diving Charter. Indies Trader Marine Adventures. [April 14, 2013]. （原始内容存档于2013年4月27日）. Bulletin Editors, Operation Crossroads: The effect of the Atomic Bomb on Naval Power, Bulletin of the Atomic Scientists (Chicago), February 15, 1946, 1 (5) （英语） . Naval Historical Center. Operation Crossroads: Fact Sheet [十字路口行動數據列表]. [2012-08-03]. （原始内容存档于2012-10-24） （英语）. Random History. The Tiny Swimsuit That Rocked the World A History of the Bikini [改變世界的比堅尼泳衣簡史]. 2007 [2012-08-03] （英语）. Niedenthal, Jack. A Short History of the People of Bikini Atoll by Jack Niedenthal [比堅尼原住民簡史]. 2008 [2012-08-03] （英语）. U.S. National Library of Medicine. Animals as Cold Warriors: Atomic Animals [冷戰的動物戰士：原子彈實驗動物]. [2012-08-03] （英语）.